The one place every queer Muslim person I spoke with mentioned was the LGBT Muslim retreat, which happens once a year. The three-day event brings together over 100 people of different ages, races and ethnicities, genders, abilities, and experiences with Islam. In other spaces, “we’re always having to justify, we’re always on the defensive. It’s almost like you have you put on your armor to do battle,” Okoye says. But at this retreat, there’s no hiding, explaining, or justifying who you are. “I wait impatiently for those three days to feel alive,” Munhazim says. It had been one year since the United States invaded Iraq. At the time, Ms. Okoye was working with the Transportation Security Administration, screening passengers at Baltimore’s international airport. The job was a kind of crossroads between Islam and America. Ms. Okoye bonded with the ex-military personnel working by her side, even as she fought her supervisor for the right to wear her hijab. She was unsure of what disturbed her more: the Muslim passengers who were always pulled aside for scrutiny, or the fresh-faced soldiers who left for Iraq “walking and full of life, only to return in a wooden container smaller than a shoebox,” she recalled. 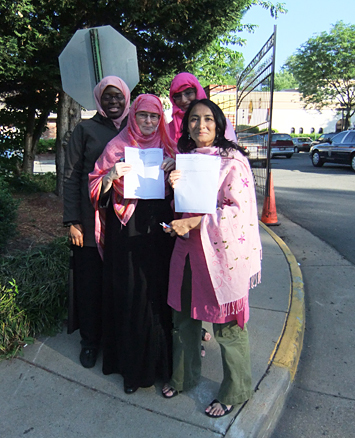 Last year, Thompson launched a “Pray In” campaign in Washington-area mosques, and this was our fourth action . With us, Ify Okoye, 27, a Nigerian-American Muslim convert, and Krysta Camp, 28, an American-Muslim convert, strode forward to reclaim in the 21st century rights that women enjoyed in the 7th century when the prophet Mohammad let women pray in the main hall of his mosque without forcing them behind any partition. Even absent the question of war, Western Salafis ponder their loyalties. Internet forums buzz with talk about the concept of al-walaa wal-baraa, which is rooted in Koranic verses dictating allegiance to Muslims over non-Muslims. Qadhi’s students are divided over whether to vote, pay taxes that support the military or even celebrate Thanksgiving. “These sorts of things, they are the fault lines,” says Okoye, the student from Maryland. Imam Safi Khan met with Ify Okoye, a Pray-In member who lives close to Dar-us-Salaam and often attends his Friday khutbah. Okoye called for the meeting, asking about the prayer arrangement for women at Dar-us-Salaam. A revert Muslimah like Thompson, Okoye said it’s “bad da’wah” when she brings her female non-Muslim relatives to the masjid and they discover women pray behind a partition. Ify says: The Muslim Link Breaking the Ranks or Peaceful Protest? At the protest last Saturday, there was a tense scuffle when three men approached a protester (me) videotaping the scene. Asra Nomani for The Daily Beast: Let These Women Pray! Ironically, the weekend incident raises an important question about whether there truly is suffrage for Muslim women in America. It seems not. Even conservative Muslim women are chafing. 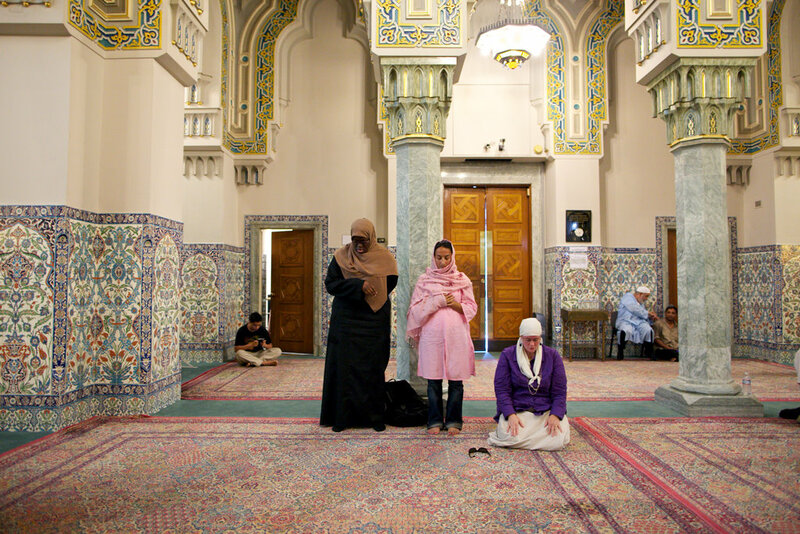 Recently, Ify Okoye, a Nigerian-American convert, wrote an article, “The Penalty Box: Muslim Women’s Prayer Spaces” on a mostly hard-line Web site, complaining about the separate and unequal space women get at most mosques. An adult convert to Islam, Ify Okoye spent her first couple of years learning about the religion from books. It wasn’t until the Beltsville woman started going to seminars given by the AlMaghrib Institute that she really began to understand her new faith. “I look at my Islam completely as the pre-AlMaghrib phase and the post-AlMaghrib phase,” says the 25-year-old Okoye, a student at Bowie State University. “After attending my first class, I see there’s such a breadth and depth to the Islamic tradition, and also a real practical intellectual tradition that’s vibrant, that can work today, that Muslims in America. Hi,am so happy to come across this website.I’m an ibo muslim from Enugu state.I’m touched by this because I felt as if I’m the one putting my joy and dilemma down as an ibo muslim.I’m also happy to meet a fellow ibo muslim woman and will like to keep in touch with her.You can reach me through ma email address.maasalam. Ada, so pleased to hear from you, thank you stopping by my blog. Ada..You are not alone..There are many Ibo Muslims out there..I know the feeling you get especially in Ibo land where they are predominantly Christians..Its a hard nut to crack when you hear that an Ibo person from Nigeria is a Muslim.may Allah make the jihad easy for you because i believe it is a struggle..Continue to hold on tight my dear…Allah is with you. ASAK/wrwb: So far I attended two Al-Maghrib Seminars Divine Link Fiqh of Salah and Purification Act Fiqh of Worship . I not only enoejyd every bit of two-weekend sessions but learned and improved my knowledge quite a bit. Now I look forward to take more of these classes from Al-Maghrib Institute and encourage my entire family and friends to take these classes. I was anxiously waiting for the Love Notes Marriage & Family Life which was going to be held on February 4-6 in Albuquerque, but unfortunately it got cancelled which was a very big disappointment for me and my family. But, InshAllah, if more classes come to Albuquerque, I am planning to attend each one of them. Right now, I can’t afford to travel to other cities to take these classes, but in future, by Allah (SWT)’s blessings, if I can afford, I will definitely travel and attend these classes, it is well worth it for the amount of information and knowledge these classes offer to us. May Allah (SWT) bless all of us with Islamic Knowledge to teach others and make us successful in this life and in the life Hereafter. Ameen! Asalam alaikum,dearest sis,i am very happy to meet an igbo muslim like myself,masha ALLAH,may he bless and make all our trials easier,amin. Wa alaykum salaam, welcome to my blog, delighted to hear from you, and amen to your prayer. Delighted to meet you and amen to your prayer.